Patagonia’s Rain Shadow Jacket is a great choice for a light-weight but durable shell jacket that is at home on light hikes all the way up to pretty serious summits. It packs small and is light enough that you have no excuse not to have it. If you are willing to give up some refinements like chest pockets then you will find this is a no-nonsense jacket that represents exceptional value and still has the essentials like pit-zips and a hood the adjusts over a helmet. If, like me you normally use a softshell jacket to keep light rain and wind off but want something a little sturdier to keep out the real wet when it starts bucketing down, then this is ideal. Good value as it costs half the price of many other rain jackets. If this jacket were a car, it would be a Toyota Camry-that perfect balance of price, performance, and clean style. Like any good shell, it did more than shed spring showers; it kept me dry even during an unexpected 60 mph blow in the Colorado Rockies. And like an LX model, the Rain Shadow comes fully loaded, with a roll-down, brimmed hood, two roomy pockets in front and one inside, snug-fitting hook-and-loop cuffs, and two-way pit zips. Patagonia’s H2No fabric breathes well, and showed zero wear even after I wore it for a week straight on a soggy spring trek. Best of all though, is that this is a jacket that won’t break the bank. It normally retails in the U.S. for about $150 and is listed at Rock and Run for 100 pounds, cut to 45 pounds on sale. That’s not a bad price to pay for Patagonia build quality, which hasn’t ever let me down. And no, I don’t have a commercial interest in the store, (just in case you were about to ask). Update: The guys over at Heart-rate-monitor.review.com have also given the rain shadow a pretty good write up. With waterproof seams and pitzips the Rain Shadow is ready for ski-touring or springtime hiking. Made with a relaxed fit, this jacket can be worn over fleece layers for a day in the snow. 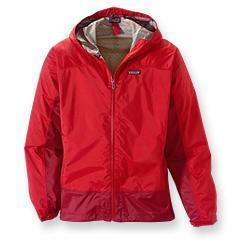 Designed to be packable andlightweight, the Rain Shadow is a great companion for foul-weather fun. About the only thing in its class in terms of weight, is the Marmot Pre-Cip, a jacket that costs about 1/3 less but that may have given up just a bit too much durability in shaving the ounces. I got one in Fall ’07 & love it. Fit is comfortable & whole thing feels of excellent quality- great details, esp. the taped zippers & very effective pitzips. I’d like it if the hood rolled down more neatly, but… Lightweight and secure in the rain, looks nice, has not let me down.